This course explores ethical dimensions of clinical practice, involving boundaries in psychotherapy and analysis when illness, mortality and major changes in the life of the analyst enter the relationship. We'll look at how therapists and analysts can prepare in advance for the possibility of their illness, incapacity or death, including working on preparing a professional will. Ethical considerations for framing self-disclosure when the analyst is ill, incapacitated or dying, and ways in which significant events in the analyst's life can impact the work of therapy will also be explored. The program will illustrate how these challenging situations can be approached through an inner function that guides our process toward ethical behavior, a function that is every bit as powerful as external rules and laws. We'll integrate theoretical, clinical, personal, archetypal and practical approaches to ethical questions. This course satisfies the requirement for 6 CEUs in ethics for license renewal. There will be a brief closure of the Bay Bridge while there is demolition work done on one of the piers of the old bridge. This is scheduled to take place about 1pm and should only last 15 minutes. Likely there will be no impact on your commute at 10am and 5pm, but those of you who are coming from the East Bay should check on traffic reports that morning, just in case. LUNCH: Also, some of you have expressed interest in having a lunch provided, and we're looking into the possibility of having a simple lunch available at a cost of $15, to be paid for on Saturday. There would be both vegetarian and chicken options. We would appreciate your responding promptly to ruthbear@pacbell.net and indicating whether or not you'd be interested in purchasing a lunch that day. We will confirm with you by Thursday if there is sufficient interest in this plan. Ruth Palmer, MFT, is a Jungian Analyst, and has been in private practice in the East Bay for over thirty-five years. She has written and taught extensively on the subject of analysts facing illness, death and retirement, and has provided coverage and support for many colleagues facing these difficult situations. 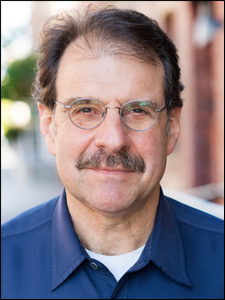 Mario Starc, PhD, is a licensed clinical social worker with a private practice in psychotherapy and consultation in Berkeley and Tracy. He received his BA from UC Berkeley, his MSW from CSU Sacramento, and his PhD from The Sanville Institute. He is an advanced candidate at the C. G. Jung Institute of San Francisco, the current dean of The Sanville Institute, and on the faculty of The Psychotherapy Institute in Berkeley. In addition to his work in psychotherapy, he has many years of experience in healthcare consultation, and has a long standing interest in refugee identity, culture, and the psychology of culture. Steve Zemmelman, PhD, is a Jungian psychoanalyst working with children, adults and couples in Berkeley and San Francisco and an Associate Clinical Professor in the Department of Psychiatry at UCSF. He has published papers on a range of topics including transference, the archetype of initiation, Jewish mysticism, Freud and Jung, suicide, joint custody and the Coen brothers. He serves as chair of the Extended Education program at the C.G. Jung Institute of San Francisco.